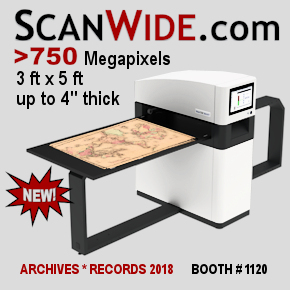 Increase your visibility at ARCHIVES * RECORDS 2018! Now you can enhance your marketing message to ARCHIVES * RECORDS 2018 attendees and prospective attendees – before, during, and after the conference! All eyes are on the conference website and advertising to members and prospective attendees is a great way to reach your target audience and reinforce your marketing message. Prospective attendees review it to determine whether they’ll attend the conference and to register. Speakers set up their profiles. Registrants return to the website again and again to see what’s been added to the program – and to create their own schedules. Your ad will run on each page of the conference website and directs visitors to the landing page of your choice to expedite purchases! (Please note that your ad will rotate with other ads.) This marketing opportunity is limited to companies that exhibit. The preliminary program flyer is available to more than 7,000 current CoSA, NAGARA, and SAA members as well as past meeting attendees and archives, records, and information professionals who live and work within 500 miles of the conference site. It's a major tool that prospective attendees use to determine if and when they will attend the meeting. This marketing opportunity is limited to companies that exhibit. Limited space available. The Onsite Program will be referred to again and again during the conference and then will remain on the shelves of more than 2,000 conference attendees as a reference. This marketing opportunity is limited to companies that exhibit.